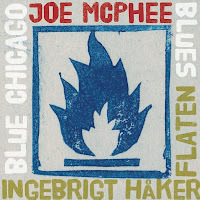 Joe McPhee has already released several duets with bassists, including several with Dominic Duval and Michael Bisio. He had played with bassist Ingebrigt Håker-Flaten in "The Thing". Now McPhee plays this nice album, an almost complementary album to his duet with Pal Nilssen-Love, "Tomorrow Came Today". For the occasional reader: I am a great fan of McPhee, and hence easily enthusiastic about any of his releases, and so it is with this one. I also like duo performances. So, McPhee in a duo album has a great probability for a great appreciation. He brings nothing new here though, nor does Håker-Flaten, but the playing itself is so good, so expressive, that it is a worthwhile listen for the fans. The cover art with its ambiguous blue flame illustrates the music quite well, it is both heart-warming music to listen to next to the fireplace, but it can only be seen as a warning sign for highly flammable and explosive stuff. The more explorative pieces are "I Love You Too, Little Baby", "Cerulean Mood Swing" and "The Shape Of Blues To Come". The sad and bluesy pieces are "Requiem For An Empty Heart", in which McPhee sings while playing his sax, after a long slow bass intro by Håker-Flaten, and "Legend Of The Three Blind Moose", a slow spiritual improvisation, offering a great finale for the album. The first track, "Truth In The Abstract Blues" has a rhythmic repetitive phrase, reminiscent to the Fred Anderson, the great Chicago sax player, to whom this album is dedicated. But the music is fun too, as the titles of the tracks already indicate, with their references to some of the great bluesy tracks of jazz history.